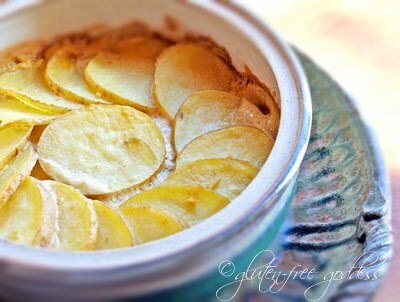 On a whim and out of nowhere (and at 2:54 AM, I'll have you know) I began conjuring images of creamy scalloped potatoes. Odd for someone who must avoid cheese and cream and butter and who- most days- is reconciled to her cheese-free life with a shrugging Lebowski-Zen detachment they write books about. Not to mention, it's been (literally) over a decade since I made this retro recipe, cream or no cream. Alas, I simply couldn't get the idea out of my sleepy Ewan McGregor -esque spiky head. The vegan scalloped potato challenge bit me. And refused to let go. To make my pre-dawn vision a reality this classic recipe would need some serious tweaking. I mean, it's not just cheese you have to replace (and I'm no fan of plastic vegan cheeses, let me tell you). There is cream. And sweet moo-cow butter. Three key ingredients that make this comfy dish so melt-in-your-mouth delicious. Lucky for me I happened to have some dairy-free cream sauce left over from a vegan pasta I had tossed together the night before. A thick and silky hemp based sauce featuring artichokes and wine. Accident? Destiny? Or simply the collective unconscious zeroing in on post-midnight potato cravings when your serotonin is dropping so fast your heart beat skips and triggers a hot flash? To keep this recipe vegan, I used creamy Soy Dream Original in my white sauce, but dairy-free almond or hazelnut milk would also work. Or unsweetened coconut milk in cartons. If you have a gluten-free dairy-free cheesy "Parm" you like, sprinkle it on top of the potatoes before baking. Boil a pot of salted water. Slice the potatoes thin and parboil them for 5 minutes; drain. In a saucepan, heat the olive oil over medium heat, and stir in the rice flour (I use a whisk to do this). Cook and stir the flour for about 30 seconds- it will make thick paste- and continue stirring to cook the raw flour taste out of it. Slowly add in the soy milk, whisking to blend. Bring the mixture to a bubble (it will thicken as it heats) then reduce the heat to low. Add the nutritional yeast, tahini, onion, galic, sea salt, nutmeg, mustard, vinegar, white wine; whisk to blend. Add in the chopped artichokes. Continue heating and stirring the sauce over gentle heat for about five to ten minutes till thickened. Remove from heat. Rub a clove of raw garlic in a gratin style shallow baking dish or casserole. Layer about half of the sliced potatoes in the bottom of the dish. Pour half the sauce over this layer. Press down a bit, making sure the sauce seeps in and around all the slices. Add in the remaining potatoes and pour the rest of the sauce all over the top. Press down a bit and shimmy the edges to allow the sauce to sneak in all around the edges. Cover and bake for 50 minutes in the center of a 350ºF oven. Then uncover and bake for an additional 10 to 15 minutes, until the potatoes are fork tender. See Nicole's tempting Butternut Squash and Sweet Potato Gratin recipe at Pinch My Salt. For a moo-cow dairy cream and butter version of scalloped potatoes, see Elise's Scalloped Potatoes Recipe at Simple Recipes. 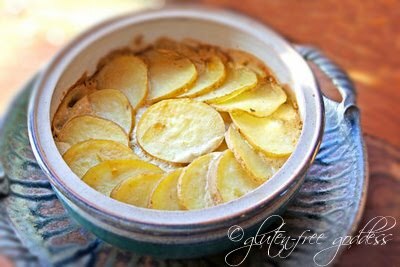 Susan at FatFree Vegan Kitchen also has a gluten-free dairy-free version of Creamy Scalloped Potatoes. For a tasty potato alternative, see Amy's Double Stuffed Baked Potato recipe at Cooking With Amy.